With less than a week to go until a defining General Election, no-one can predict the make-up of the next Government with any confidence. In our extensive analysis we explain why this election matters so much for farming. In our table below, we have summarised the key farming and rural policies of the seven main UK parties. Who has got a food plan? Who is in, and who is out, when it comes to Europe? Where do the main parties stand on the badger cull? Which parties are promising to cut red tape? And scrap EU regulation? And which party wants to save the British country pub. For our extensive summary of the party positions on this and much more, click on our table below. In some areas, there is little to fundamentally divide the parties. For example, they all want to accelerate the roll out of superfast broadband and most pledge to use public procurement to support local farmers. Not that we haven’t heard either of those before. But here we pick five policies which set out stark some really stark choices for voters. 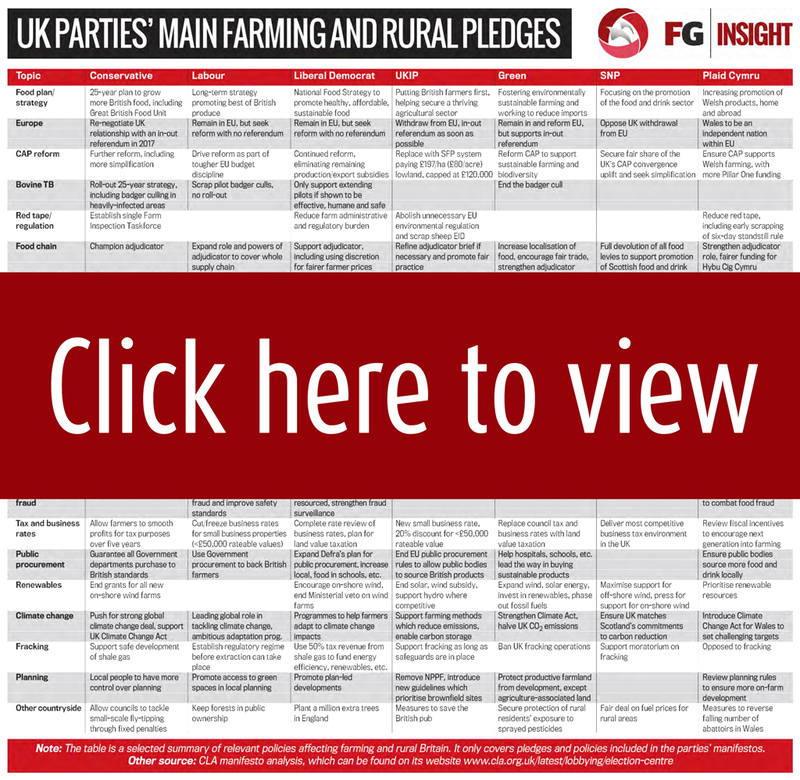 Most of the big parties have pledged to introduce a food plan or, if not, they have outlined their philosophy on food and farming in their manifestos. There are subtle, and some not so subtle, differences in each. The Conservatives put the emphasis, for example, on ‘growing more, buying more and selling more British food’. This includes the establishment of a Great British Food Unit to help trademark and promote local foods around the world and in the UK. Labour also ‘supports a world class, thriving food and farming sector’ promoting productivity and jobs, reinstating its Food 2030 plan. But there is a much greater emphasis on improving standards across the food chain, including on food safety and standards and the conditions of workers. The Liberal Democrat’s food plan is greener, focusing on measures to promote healthy, affordable, local food, while the Green’s detailed policies are, unsurprisingly greener still. Plaid’s overall approach to farming is highly supportive of productive farming, notably on CAP and red tape, while SNP’s is short on detail. The Conservatives, Liberal Democrats, UKIP and Plaid all highlight their desire to cut red tape farms, the Conservatives pledging a single Farm Inspection Task Force to reduce the number of inspections. Labour Shadow Farming Minister Huw Irranca-Davies has insisted his Party is, unlike the Conservatives, not ideologically opposed to regulation, but supports ‘smart regulation’. One of its most eye-catching policies, for example, is a task force to address low pay and conditions among farm workers to replace the Agricultural Wages Board (AWB) abolished by the coalition. It will also look to beef up the Gangmasters Licensing Authority. The Tories will continue to implement the TB eradication strategy, including culling badgers where disease is rife. Labour would scrap the two pilots half way through and cancel all plans of roll out, although it would, it said embrace the rest of the strategy. This would be a hugely divisive policy, particularly in Gloucestershire and Somerset and across the TB hotspot areas, and would set a Labour Government off on the wrong foot with farmers, industry leaders have warned. Shadow Farming Minister Huw Irranca-Davies has promised a Labour Government would work with Defra's chief and the industry to find a 'better way' to address the problem, including vaccination. Under the previous Labour Government, its position on the badger cull often served to undermine relations between farmers and Government. There is a real danger history will repeat itself. The Liberal Democrats have hedged their bets, saying they could only support culling if the evidence showed it to be effective and humane. In the previous Government the Liberal Democrats claimed to be instrumental in halting the pilot culls in 2012, even though Liberal Democrat Farming Minister David was a big supporter of the policy in is time in office. The Conservatives would hold a referendum on the UK’s membership of the EU, following a re-negotiation of the relationship, while UKIP would push hard for the so-called Brexit and relief from EU red tape. Most of the others want to stay in Europe and would no offer a referendum, with Labour and the Liberal Democrats extolling the virtues of reform from within. The Conservatives say it is right to give the public a say and its leadership want to remain in a reformed Europe. But, while EU red tape is a burden for many, with the CAP and the single market at stake, many farmers are concerned at the prospect of a referendum. Everyone wants further reform of the CAP, just with different priorities. The Conservative’s approach is about simplification, for example of greening, but also about cutting the EU budget and shifting the emphasis more onto using funding for public goods. Labour’s approach is not dissimilar, although it has already stated it will move to the full 15 per cent transfer to Pillar 2 and would ask more of big subsidy earners. But do the two main parties want to scrap direct payments? On this question, both have said they do not want to disadvantage UK farmers, suggesting they would not push to remove direct payments against the general flow, a shift from past rhetoric in both cases. The Liberal Democrats and the Greens want the CAP to go further in supporting sustainable farming, although the Liberal Democrats stress they would retain direct payments. UKIP has outlined how it would support UK farmers, at £80/acre for lowland, with ELS standards required to qualify, with sufficient funding available as the UK would no longer be putting more into Brussels than it takes out. Plaid wants the CAP to support farmers. But, with the SNP potentially set to hold the balance of power with Labour, its position on the CAP could be as significant as any. It will be pressing for a fairer share of CAP money for Scotland, in the wake of unpopular convergence settlement deliver by former Defra Secretary Owen Paterson – something that would be much easier to press for in some sort of partnership with a Labour Government. How influential will the rural vote be? Around 12 million people live in the countryside and their vote could be pivotal in deciding who gets into Number 10. Parliament is often accused of harbouring an institutional urban bias but, with this election so tight, the countryside will have a major say. This election, as any other, will be decided by the outcome of the marginal seats. Analysis of these show many can be classed, entirely or largely, as rural seats. Our map above shows some of the most marginal, highlighting, the seat, the majority in 2010, the incumbent MP and Party and the Party that was the nearest challenger in 2010. 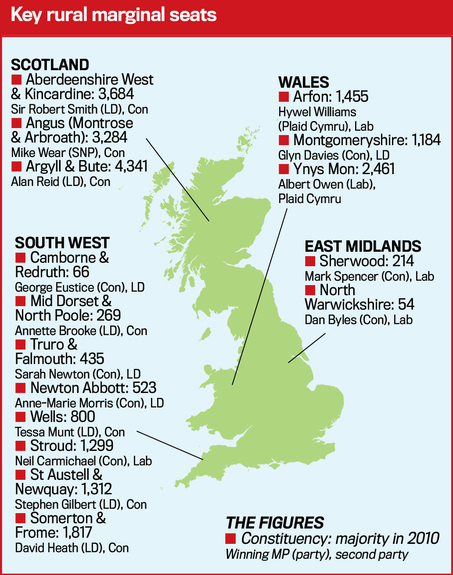 As the graphic illustrates, a good number of these can be found in the South West of England, where the Lib Dems either won or came to close to winning in 2010. In one of the rightest, Cambourne and Redruth, in Cornwall, Farming Minister George Eustice holds a majority of just 66 over the Liberal Democrats. The likely drop off in the Lib Dem suggests his position might not be as precarious as it looks, however. In Scotland, such is the SNP’s surge, seats that would not normally be classified as marginal will be under threat, as Nicola Sturgeon's party looks to be on course to dominate the Scottish political landscape. This election is set to be one of the closest in living memory. For the past few months the polls have put the two main parties virtually neck-and-neck. At the time of writing the BBC’s ‘poll of polls’, probably the most accurate gauge of voting intentions, put the Conservatives on 34 per cent and Labour on 33 per cent, with UKIP on 14 per cent and the Greens on 8 per cent. The odds on either Conservatives or Labour doing enough to secure an outright majority are slim. With 650 seats in Parliament, 326 are needed to cross the finishing line. If neither Conservatives nor Labour reach that figure, the smaller parties come into play. The permutations in the event of a ‘hung parliament’ are endless. And it does not have to be a formal coalition. Labour and the Conservatives could both lead a minority Government, under which, without being formal partners, minor parties can enter into ‘confidence and supply’ where they support the Government in certain key votes. In 2010 the problem was solved as the largest Party in terms of seats, the Conservatives, teamed up with the Liberal democrats in a formal coalition. But that might not be so straightforward this time. With the Lib Dems expected to lose a large number, potentially half, of its 57 seats, including possibly leader Nick Clegg, this combination might not be enough in 2015. The Conservatives would need more support, including possibly from Northern Ireland, to get over the line. The smaller parties, UKIP (which the polls suggest will be forced to dramatically lower its expectations after last year’s euro-election surge), Plaid Cymru in Wales, the Greens and the Northern Ireland parties could all have a role to play. But the real story of this election is the rise of Nicola Sturgeon’s Scottish National Party, set to make huge gains north of the border. One poll has suggested SNP could win all 59 Scottish seats, wiping Labour out of its former stronghold. This opens the prospect of a Labour alliance with the SNP, although Labour leader Ed Miliband appeared to be vehemently opposed to that idea during a BBC Question Time event on Thursday, and possibly others, including the Liberal Democrats – even if Labour does not win the most seats. Despite Mr Miiband's stance on on an SNP deal, it is for this reason, the bookmakers, for what it’s worth, made Ed Miliband odds on favourite, to be the next Prime Minister (again at the time of writing). And tellingly, even though the Conservatives remain strong favourites to win the most seats, a Labour minority Government was considered by the bookmakers the most likely outcome. Previous: A growing role for biologicals?